Please see last week's posting for further details! There will be a further meditation for World Peace through 8pm GMT tonight, 19th June 2014. 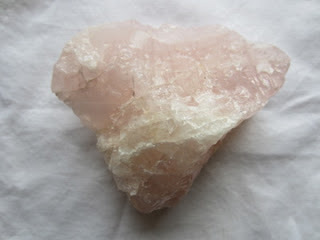 This meditation will use the heart shaped rose quartz chunk shown below as a positive focus. Hope you can join us from where ever you are based across the Globe. This meditation will be repeated at the same time next Thursday. There will be a meditation for World Peace through 8pm GMT tonight. This meditation will use the heart shaped rose quartz chunk shown below as a positive focus. Hope you can join us from where ever you are based across the Globe. Harr struggling to clear here in Orkney this morning, otherwise a lovely summer's day with lots of flowers out on the cliffs.